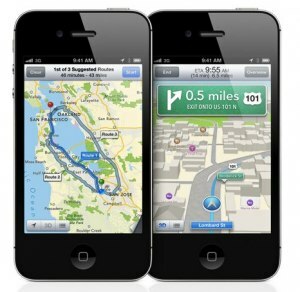 Despite the fact that I’ve been a fan of the Apple’s ecosystem, I could not pretend that I’m happy with the feature that defines iOS 6 – the Maps. 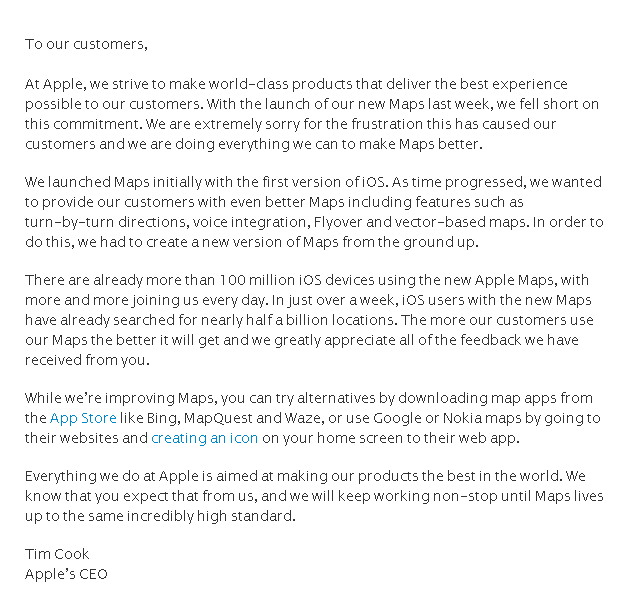 And after 10 long days of disbelief with the current Maps application, Apple CEO has written an open letter to every unhappy customer. Atleast, I was delighted to know that Apple is prioritizing it above anything else; but the fact that Tim Cook suggested the use of rival mapping services like Google and Nokia Maps raises my eyebrow. Check out the letter after the jump. The Maps arrived with the latest version of iOS last week with Apple collaborated with C3 Technologies to offer 3D Flyover views and Turn-by-Turn Navigation. This has dropped Google Maps out of the water. While Apple believes that they gave better mapping alternative to customers, backlashes had popped out like mushrooms everywhere. So to recognize the disbelief, CEO Tim Cook writes that they are "extremely sorry for the frustration" and they are "doing everything" to make the Maps better. The highlight of the said letter was Tim Cook's suggestion of using Nokia, Google and even Bing Maps as alternatives in the meantime. For iOS users, all we can do for now is cross our fingers that Google Maps will be available in the Apps Store because, as bad as the new Maps may be, it would definitely take a little while for Apple to patch the flawed mapping service.